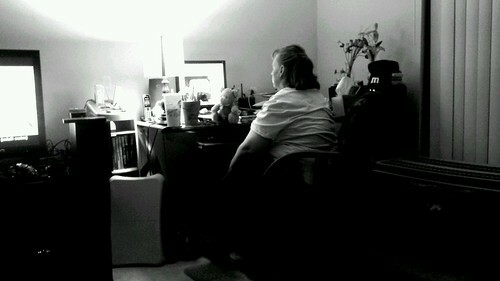 Tammy at the computer, a photo by krisguy on Flickr. So much for blogging every day. That went over like a balloon filled with mercury. I am working on getting back into the swing of things with school, which started last week. I didn't realize that taking a literature class and philosophy at the same time should not be allowed by federal law. I'm going to have to do a lot of writing and reading for these classes, so I might be less apt to try to come up with a cohesive thought on this blog. I have one teacher that seems to assume that if you write less than 300 words for an assignment, you don't understand or didn't read the work. I still plan on using this blog, just not as much as I hoped. Please continue to follow me on Google+ and Twitter. I think that I'm done with FB, except to watch what my son does. 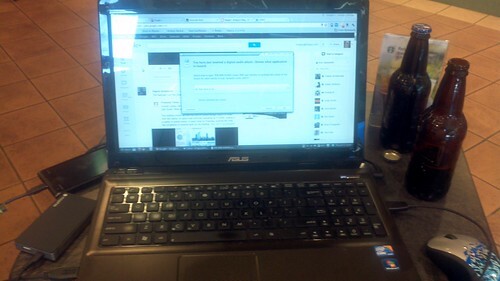 my table in the AM, a photo by krisguy on Flickr. When it comes to writing skills, I'd say I'm pretty good. I know I have a way to make complicated tasks boil down to simple analogies. I thrive in positions were "technical support" is part of the job description. Like any other skill, writing is a "use it or lose it" proposition. I keep trying to tell my son Alex that if he doesn't write at least 2 times a week on summer break, then getting back into the flow when school starts will be harder. I'm going to heed my own advice. Starting today, a blog post every day until my surgery on Friday the 13th (Note: I just now realized I'm getting a vasectomy on Friday the 13th. Let the superstition nuts start talking). I think the easiest thing is to do reviews of things I use when I don't have more passionate topics. Here's to new beginnings. If you have something you want me to opine on, tell me on G+, Twitter, or e-mail me at <mynick> at <mynick> punto commercial domain.